A Sneak Peek on Saturday Night (11:30 ET). “Milk” Dark Chocolate. The most popular request we received was for a ChocoNuvo that, although still Dark Chocolate, could taste so close to Milk Chocolate that you might actually believe it was Milk Chocolate. That is our new ChocoNuvo 66% and Muriel swears it is. It was designed to be the first healthy Dark Chocolate to satisfy the taste buds of someone who loves Milk Chocolate, but without any milk or dairy. “Extreme” Dark Chocolate. The second most popular request came from serious dark chocolate lovers who wanted the richest, darkest chocolate experience with the creamy texture of Milk Chocolate, but without the bitterness of Ultra-Dark Chocolate. That is our new ChocoNuvo 91%. It is the first Extreme Dark Chocolate with the creamy texture of Milk Chocolate, but Ultra-High 91% levels of cocoa solids. These two new ChocoNuvo “Intensities” result from my having tasted literally hundreds upon hundreds of different blends of cacao beans and varieties of Dark Chocolate over the last year or so. Whatever your taste preference, I am sure you will be happy. Of course, our two new varieties will lower cholesterol just as well as the original 74%, and our unique process ensures they have the melt-in-your-mouth creamy texture of Milk Chocolate. We will continue to offer our exceptional 74% Dark Chocolate, but for those seeking a Milk Chocolate experience from their Dark Chocolate, we have added our 66% Dark Chocolate. I just call it “Milk Chocolate without the Milk, but all the benefits of Dark Chocolate.” It will be every Milk Chocolate lovers’ healthier new favorite. Now, for those of you who are super-serious about your healthy Dark Chocolate, I tried to create something at greater than 80% cocoa solids and was surprised to arrive at a non-bitter, creamy textured 91% Extreme Dark Chocolate. Its rich dark flavor will still feel like creamy Milk Chocolate in your mouth, but without the dry, bitterness of typical Extreme Dark Chocolate. We planned on introducing these new Intensities next October (after summer), but frankly, we had no idea which ones you’d prefer, so I wanted to find a way to gather feedback on your preferences to plan our fall and winter production. In short, we had to figure out how to ship chocolate during the summer to hear your experiences and preferences. As difficult as creating these two new Intensities of ChocoNuvo might have been, it almost seemed easy compared to figuring out how to perform summer shipping. In fact, one of the world’s largest chocolate makers created a contest with a huge reward to help them figure out how to securely ship chocolate in summer. This was not going to be easy to accomplish, but since we truly make our ChocoNuvo “on demand,” we needed some feedback on your preferences to see how much to produce of each “Intensity” this fall and winter. As I mentioned last March, ChocoNuvo was going away for the summer since, like most companies, neither HSN nor PCL could securely ship chocolate during the summer. However, our need to understand your preferences encouraged us to make this summer shipping project a challenge for everyone at ProCaps – especially me. We have been working on it nonstop all year and I am pleased to say, we have arrived at a solution. It is a very costly solution, since it involves multiple cold packs inside each container and Second Day Rush shipping of some heavy boxes, but it is something we are prepared to do for a small number of orders during a couple of brief airings over the next two weekends (or for as long as our limited supply lasts). By the way, despite the rush shipping, cold packs, heavy boxes, etc., this limited trial of ChocoNuvo will come with Free Shipping and Handling. It will also have Special Birthday Pricing. It will only come in one size (100 Squares) and you can choose from any combination of 66%, 74% and 91%. Your first bottle will be at Birthday Pricing and any second bottle will be at $10 off Birthday Pricing and any third or more bottles will be at $20 off Birthday Pricing. We simply ask that you try to limit your purchase to 3 bottles per household, so as many folks as possible can try the new Intensities. The purpose of this very, very limited offer is for you to share your preferences and thereby help us plan our production for the fall and winter. All I ask is that you be kind enough to share your preferences about the ChocoNuvo Intensities in terms of what your orders might be in the future. You can call us to let us know your preferences at 800-800-1200 or by the end of this month, we will have a special page at ChocoNuvo.com where you can provide your taste preferences and thereby help us plan our production for the fall and winter. The ChocoNuvo will not be shipped until the end of July because of the extraordinary preparations and lengths we must go to in order to make this possible. Because, like most companies, HSN does not have the systems in place to ship chocolate during summer, therefore these orders will be shipped directly from ProCaps Laboratories. Moreover, since we also do not have the systems to do this, we will, for this one-time event, install an enormous tractor-trailer sized freezer in our facilities. We will then place a few thousand bottles of all 3 Intensities of 100 Square ChocoNuvo with 3 cold packs inside each bottle (the cold packs work better if placed inside the bottle) and those bottles will then be pre-frozen before they are shipped to you. But I am not done. Because we are in the desert in Henderson, Nevada in the middle of summer, we will then wait until nightfall and each evening load those frozen bottles of ChocoNuvo into a special refrigerated truck that we will drive directly to the UPS facility at the Las Vegas Airport. In short, we are taking no chances at all. These orders will come packaged in special white, higher insulation recycled and recyclable corrugated cartons. Despite the extraordinary costs of doing this, we are shipping these to you Free using Second Day Air (which normally costs us almost $20 per container!). As I said, you will be able to choose any one, two or three bottle combinations of the 66%, 74% and 91%. There will be Special Birthday Pricing, additional savings on the second and third bottles and most importantly, Free Shipping and Handling. If you order, I encourage you to share your preferences with us, since that was the purpose of this Special Summer Offer. Thanks in advance! Wow…I intended this to be a very brief blog post, but as usual, I got carried away. I look forward to seeing you on Saturday evening at 11 PM and for our Today’s Special at midnight. There will also be a Sneak Peek at the Today’s Special at 8 PM Eastern Time tomorrow. The ChocoNuvo Special Offer will air at approximately 11:30 PM Eastern Time for approximately 8 minutes. See you then. 47 thoughts on “ ChocoNuvo News! Looking forward to the “dairy less” milk chocolate; assuming the only ordering opportunity will be Sat evening? I love your healthy hair skin and nails. Is therea liquid form. I cannot swallow any pills or powders because of my esophagus problem. I also have problems with my throat and need liquid or chewable for my supplements. Would order more of the products if I had. Choice. of it. Much to my regret!! I do not need the problem of having a hairy chin. Other than that I do love Andrew Lessman products. This is huge news! I might be persuaded to purchase at least one of the Milk Chocolate 100 size. If I tell my best friend and sister, then I might purchase three of the Milk Chocolate. I applaud all of the brainstorming, associated costs, and effort associated with this new product development. While I do enjoy the 74%, I am more of a milk chocolate lover (this might be a bit dangerous though with my sometimes relaxed self-control however). In March, I purchased two of the 300 count ChocoNuvo and still have about 450 left from this purchase. I did not want to chance running out before they were available again. I’m looking forward to seeing you on HSN for the next two weekends. I love the Dark ChocoNuvo and can’t wait to try the Extreme Dark. Do you have an estimate of the amount of theobromine in each? I am wondering if a ChocoNuvo evening snack will interfere with my sleep. I am soooo excited about the new chocoNuvo chocolate that taste more like milk chocolate!! I love milk chocolate and have never liked dark chocolate until your ChocoNuvo came out. I really enjoy ChocoNuvo! I cannot wait to get the new ChocoNuvo!! My problem is I eat too many of these tasty treats:) I have to store the big jug of chocolates in the garage and bring 2 out every day into the house for my enjoyment later in the day!! I will for sure call ProCaps Laboratory and let them know how I like the new ChocoNuvo once I order and receive the chocolate. Thank you Andrew Lessman for thinking of us who are milk chocolate lovers!! I love my ChocoNuvo and I am glad that I purchased the large one. I still have some left. I keep them in the refrigerator in glass jars. I started that because when I initially received them they were sitting outside for awhile and kind of soft and the refrigerator solved the problem quickly. So there they remained…..yummy! They always taste awesome. Can’t wait to try the new dark chocolate! Must be your lifestyle of eating healthy, active…. Move…move….Move! I will order this ChocoNuvo product at every opportunity…Thank you, Andrew for figuring out how to distribute them in the summer. I ordered the largest size last December and was just wondering the other day if I was going to have enough to last until the cooler months when they would be available again! I insisted on stopping the statin drug my doctor had put me on and my LDL cholesterol and total cholesterol just kept going higher. I started taking the ChocoNuvo last December and was ecstatic to see both of these levels dropped almost 40 points thanks to these delicious treats. I like the dark chocolate and may try the 91% next. Thank you, thank you, Andrew! Love the original, but would try the 91 per cent! Have not had cholesterol tested since using these, so will do that first! Thank you Andrew. All your product are fantastic and the ChocoNuvo simply amazing. I do not have a cholesterol issue; however, when I had blood work done in April my choloesterol reduced by 37 points. The taste is yummy and it does a body good! Thank you Andrew for your wonderful products, your educational sessions on HSN and for bring good health to us all. Much appreciated! Looking forward to tuning in tomorrow evening. We will be ordering the 3 different ones. I still have a 300 bottle stored away and a 100 or so left in another 300 bottle. We live in a hot climate too (Anaheim Hills) and I have to store ours carefully. Will the cold packs cause the chocolate to turn white? My husband is diabetic and is so happy with the low grams of sugar. Will the “newer” 66% have reduced sugar grams also? Thanks from a customer since the days before the “Q” !! I’ll be 72 at the end of this month and I look and feel much younger. Love the ChocoNuvo. Will try the 91% as soon as available. You are very special Andrew! I purchased 3 HUGE jars (tubs) in March . I love the 74% ChocoNuvo . I also love that Andrew works so hard to satisfied everyone’s chocolate preferences. Also I love MOSTLY how he offers products to lower our cholesterol without aggressive statin side effects . My cholesterol is the best it has been in years ! I will try 66% chocolate and 92% dark chocolate . The 74% is delicious ( I actually love dark chocolate) , the 66% sounds beyond delicious . Goodness the 92% sounds good also. I am sure they will be great , I will leave my reviews and post my preference. Yearning for the 91%!! Extreme dark is what we love. Love all your products but like one other commenter I cannot swallow any but small pills..please remember us in future :). Hi Andrew. Love your products. Can you tell me if I can try the ChocoNuvo if I am on statins? Please advise. Looking forward to your presentations tomorrow. My husband and I have been on stating for years. We have been taking this for the past 7 months and has done wonders for both of us. The doctor reduce both of our meds. Funny doctor wants a bottle now. Andrew, I am wondering if you have ever considered mixing in some of your cinnamon product into the chocolate to balance out the sweetness and also help with blood sugar at the same time. I think it would be a nice treat for the upcoming holidays! Just a thought! Not everyone needs the cinnamon with this stunning Andrew’s invention. I am sorry but the choconuvo is perfect the way it is now. These little squares contain 1 gram of sugar. If you have type 2 diabetes and weigh about 140 pounds, 1 gram of pure glucose will raise your blood sugar about 5 mg/dl—provided that your blood sugar is below the point at which your pancreas starts to make insulin to bring it down. If you weigh 140 pounds and have type 1 diabetes, 1 gram of glucose will raise your blood sugar about 5 mg/dl no matter what your blood sugar may be, because you cannot produce any insulin to offset the glucose. If you weigh twice that, or 280 pounds, 1 gram will raise your blood sugar only half as much. A 70-pound diabetic child, on the other hand, will experience double the blood sugar increase, or 10 mg/dl per gram of glucose consumed. Dr. Bernstein will participate in another 60 minute Teleseminar and Webcast on Wednesday July 27th, 2016, at 7PM CST, 8PM EST, 6PM MST, 5PM PST designed to answer your most important questions concerning diabetes and his thoughts on the latest developments in this area. The seminar is FREE but participation will be limited and you must register. I am not promoting anything and I have nothing to do with this website. It is just that I read your comment Susan and I always research because it is always good to know. Thank you so much! I am out of the squares and really need them! I especially appreciate the special pricing and will try to buy more than 100 squares, as I am on a fixed income and need to take advantage of the pricing. LOVE LOVE ChocoNuvo!! I CAN NOT WAIT TO TRY ALL 3! I AM A LOVER OF DARK CHOCOLATE. THIS IS SO EXICITING AND I CAN NOT WAIT TILL TOMORROW NIGHT! THANK YOU ANDREW FOR ALL YOUR WONDERFUL PRODUCTS! THEY HAVE HELPED ME ENORMOUSLY! You are a life saver as hubby will be taking our last ChocoNuvo on Sat morning and he had been taking two a day but when I saw we were running low, I stopped taking them and cut him back to one a day. He had open heart surgery in Dec 2007 and his good cholesterol has always been low. Exercising and eating healthy didn’t bring up his numbers over 25. Since taking this, starting in Dec of 2015, his good cholesterol is up to 30. I was in a panic as he was going to be out for a few months because of the heat. I can’t thank you enough Andrew for what you are doing as far as the cold shipping. We are going to try a bottle in the Milk Chocolate at 66% but hubby also wants to stay with the 74% also. I will be ordering three bottles tonight when you are on! Thank you! I can’t wait to order. Since first introduced, I have gone thru 2 containers of the 300 count. Lowered my cholesterol & tasted great. What else could I ask for – no other chocolate will do & I thought I had to wait for October. 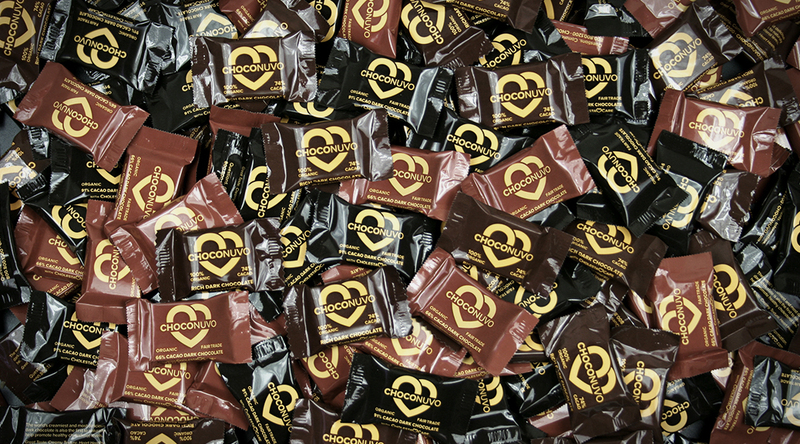 So excited to hear about the new Extreme Dark ChocoNuvo, my first choice of the chocolate varieties. I’ve shared Andrew’s chocolates with many friends and also sprinkle some bites in gift packages for a nice surprise. I live in a hot weather climate and would stock up during the cooler months to hold me over for the summer if shipping now is too difficult. I’m thrilled that the Extreme Dark is on the way! Thank you to the entire Pro Caps team!! Love the ChocoNuvo! I ordered the first time on air and actually ordered a second time to be sure not to run out. I hope you can keep this affordable as I am telling many people about this great chocolate including my Dad who is in cholesterol lowering medication and many other family members and friends. I really need the affordable prices as well as the others I share a piece with to sample them or share the great news with. I work in a hospital around many doctors as well and want to share the news with them as well. Almost everyone loves chocolate and the healthy benefits are a great plus. Andrew…..please, please keep sales and affordable pricing on the chocolates and thanks so much for the free shipping by the way. ******* I want to suggest a combination of the chocolates as well as an ordering option. Thanks Andrew! Just love the ChocoNuvo . Cannot wait to try the 91%, but do not like the taste of “Milk Chocolate”. Would love to see you make the ChocoNuvo in 91%. My husband and I will be having our Cholesterol tested in the next two weeks, and cannot wait for the results. Will keep you posted. You have a great Pro Cap team. I bought this product in December and love it. I ordered the extra dark and wait patiently to try it. My doctor is also happy with my cholesterol levels. Wow, Andrew and Muriel, thank you SO much for going to such an extreme to ship during these hot summer months when it is virtually impossible to order anything that might melt and we get our UPS deliveries late in the afternoon (Phoenix AZ area) which makes it even worse if a package has been on the hot truck all day. Looking forward to this weekends shows! I LOVE Choco Nuvo although I’m not a big dark chocolate lover! This is like the most decadent chocolate u would find overseas! So rich and creamy and VERY satisfying! Not bitter at all! Not chalky either! Just perfect! I’m such a lover of milk chocolate that I ordered the the 66% version of dark chocolate tonight that supposedly tastes more like real milk chocolate!! Soooo looking forward to getting it! This is so low in sugar and calories and great for diabetics because of the only 1 gram of sugar per piece! Andrew you hit this so far out of the park it’s unreal!! Fantastic product to lower cholesterol which in the last 2 years mine has gone from 288 to 150! Yes I’m on a statin drug but hopefully in time I can cut back on it! That would b fabulous!! Thank you Andrew for going all out to make this product available in the summer months as this is a huge cost to you! Your customers come first right up there next to your quality!! Thank you Andrew for loving what you do and blessing every one of your customers daily!! Love these chocolates! They are simply the BEST! Have been purchasing them since they were first introduced. A one of a kind, innovative, fantastic product. My cholesterol levels have been going down since. Partly because of diet and I truly believe because of ChocoNuvo. My doctor approves. My wish list is that Andrew will make a sugar free version made instead with sweeteners such as erythritol or monk fruit extract if possible. I missed out on Saturdays special. Hopefully there’s more tonight. Does anyone know if there is an expiration date for these chocolates? Where is it printed on the bottle? Thanks Andrew for these incredible chocolates! I HAVEN’T BEEN a chocolate lover but Choco Nuvo has changed my taste about dark chocolate!! I truly love the ‘original version: 74%. Now I am eager to try the 66% version (milk chocolate)! What I find truly amazing is that it is still dark chocolate!!! As soon as I receive my order, I will provide you my feedback and also I will ask my family to give me their opinions, so that I can forward it to you as well!!! Your efforts in doing this trial in the summer at a high expense really demonstrates how much you care about our opinion…thank you very much!! Your products have improve my quality of life…Please keep up with the good work!!! As a single mother, I can only afford to get these delicious, healthy chocolates with Today’s Special pricing. Remembering back to the special pricing when they debuted, it seems like a 100 count was cheaper than the pricing here with the new flavors debuting, so it seems like it’s not really “free shipping”. The $20 shipping is included in this $59/$69 per bottle pricing. It seems like the 300 count was $129 and $119 for the second or more bottles. I love the products, I just wish they were more affordable and also wish for the choices of the chocolates to be to order any of them individually in different sizes, also it would be great to have all 3 assorted flavors in one bottle. Assorted flavors is a great idea. I do wish they were a bit more affordable too. The price did go up but I thought that might be because of the special shipping and handling for this time of year. Hopefully Andrew will offer the same 300 count price special he did before. Andrew been taking your vitamins for 20 yrs and tell all my friends how wonderful they are and they work. I so enjoy your shows. Thank you for being thee for all of us. One question do you have anything for acid reflex? You asked for feedback on the new version(s) of the product. Here is my feedback. I have ordered the original version of the product just before Christmas and reordered in the Spring to have it available over the Summer. I keep it n the fridge to prevent any melting. Like most Americans, I prefer “milk” chocolate but I love the creaminess of this product. When you alerted us to the new versions, I knew I needed to try the new “milk” chocolate version. It arrived yesterday! Here is my first impression. I like it! No, love it! Maybe just a bit more than the original and in the future when you have it available again, I will probably order both versions. That is the good news. I would call the summer shipping experiment at best a mild failure. Let me explain. The frozen jell packs in the container were completely thawed. Maybe not unexpected. However, some of the squares on the top were definitely melted. I put the container in the fridge overnight to firm the packages up. What I have found is that some of the packets on the top were melted and visually, it looks like the product started to separate – there is chocolate and beige (I assume this is the plant sterols) colors and the beautiful design on the top is no more. The great news is they taste just the same as a packet that did not have any melting from the middle of the container. The other good news is that I will not return this product – and I will not share with friends as this is not fair to your company to have someone see the product in less than pristine state. I will keep this as my personal supply and let my guests have the original – Win for me! Thank-you for the attempt at summer shipping but I think you need to re-think this experiment.